Datuk Zainal Izlan was appointed Deputy Chief Executive of the Securities Commission Malaysia (SC) on 5 April 2018. He joined the SC in January 2011 as Executive Director, Islamic Capital Market and was appointed Managing Director, Development and Islamic Markets in November 2016. He is also Chairman of Capital Markets Malaysia, an entity established by the SC to promote the Malaysian capital market. 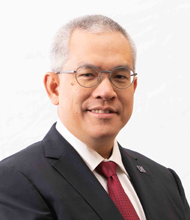 Datuk Zainal Izlan holds a Bachelor of Science in Economics (dual concentration in Accounting & Finance) from The Wharton School, University of Pennsylvania, USA, and is a Chartered Financial Analyst (CFA) charterholder. He has over 25 years’ experience in the financial services industry. He began his career with Citibank before joining MIDF Amanah Asset Management. Just before joining the SC, Datuk Zainal Izlan was the Chief Executive Officer of i-VCAP Management, an Islamic fund management firm based in Malaysia.